When evangelical preacher Harvey Kow’s beautiful wife, Holly, goes missing in Tinseltown, P.I. Polly Berger’s investigative firm is hired to find her—and prove the Right Reverend Kow is innocent of any wrongdoing. But the wealthy preacher’s wife has some secrets of her own that come to light when one of Polly’s former clients, Cinda Mae Bradbury, divulges the past occupation of the missing woman. Did Holly Kow run away? Has she been kidnapped? Or, has something worse happened in Hollywood Hills? Things heat up when Polly’s ex-husband, Hollywood Police Detective Johnny Birdwhistle, is wounded in a deadly shootout, and bodies began to turn up. With a killer on the loose, Polly is nearly murdered in a drive-by shooting, and the tarot card reader in Polly’s building mysteriously disappears after making a dire prediction for Johnny’s future. 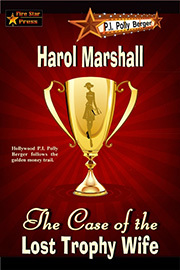 Can Polly, Bunny, and Johnny find Holly Kow before it’s too late?